Every day brings news of more Israeli atrocities in Palestine: killings, house demolitions and Palestinian families thrown into the street. The racist JNF (Jewish National Fund) is at the heart of the grim action, either planting trees to cover up the ruins of ethnically cleansed villages or even taking part directly in evicting Palestinian families to make way for Jewish settlers. 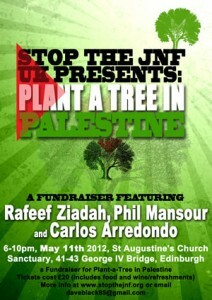 Anger in the UK at the JNF’s crimes is rising. Their fund-raising activities now take place in secret in London, while scores of Members of Parliament are calling for an investigation into JNF activities. Provocatively, the JNF is now organising a fund-raising charity shoot at a venue called Cowan’s Law near Glasgow on May 11th. This shooting event is intolerable considering that the JNF works with the murderous Israeli military and paramilitary forces to ethnically-cleanse unarmed Palestinians. Stop the JNF UK calls on supporters of Palestinian rights from across the UK and all those disturbed by the Israeli policy of shooting unarmed Palestinians to come to Cowan’s Law on Friday May 11th to ensure this provocation does not take place. 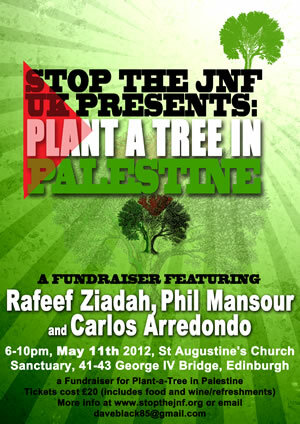 Plant-a-Tree in Palestine is a new project established in 2011 with aim of raising awareness of the tree planting activities of the JNF, and providing an effective means of solidarity with Palestinians resisting the demolition of their homes and theft of their land. It is a joint project of the Middle East Children’s Alliance, the Palestinian Grassroots Anti-Apartheid Wall Campaign (Stop the Wall), the Palestinian Farmers Union, and the International Jewish Anti-Zionist Network. The first planting action took place on January 2nd 2012, with all the partners joining forces alongside local residents and youth activists in Tulkarem, Occupied West Bank. One hundred and eleven trees were planted, representing the 111 years of the JNF’s existence, with each tree being named after a different Palestinian village destroyed in 1948. The action was a success, receiving positive news coverage within Palestine and abroad, and raising awareness of the JNF’s activities within the local communities. It was therefore decided to build the project in 2012, culminating in 3 or 4 similar planting actions in late 2012 and early 2013.